As I write this from an unusual workspace for me (a coffee shop in Plymouth’s city centre) it might seem ironic, but despite the bonuses of human interaction, the buzz of life and of course good coffee, it’s confirming how important my own workspace is to me. Having a place that is comfortable, inspiring, and familiar from which to conduct my business is important to me, as it is for many people. So much so that I recently moved my home office from a small box room into our much bigger spare room; custom building the desk and storage solutions to fit my needs and painting the room to give a bright and inspiring ambience – all to give myself the best possible environment in which to be creative and productive. It’s often the finishing touches that make a workspace really feel like home and I looked at inspiration from across the world when planning my ideal workspace. Here you can see ten of my favourites. 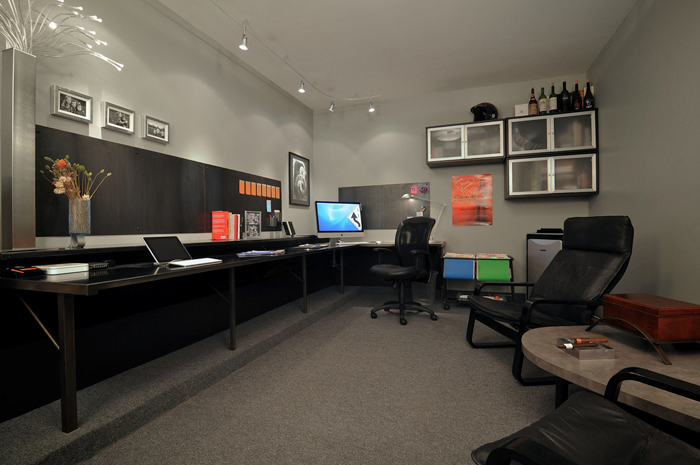 Something about this office space captivates me. It’s not to my normal taste (ie. more minimal, clean and sharp) and I’m convinced I couldn’t work on one of those old style fish-bowl screens but the huge amount of books and reference material, not to mention the lightbox table really appeal to me. The office space of Dutch design firm Yummygum has everything I admire, stylistically, in an office. I have a feeling that it isn’t always this pristine but for the purposes of the photos it works a treat. My favourite element though is again based on attention to detail – the cable ports drilled into the desk are shaped to match the form of their logo. Lovely treat! I love the stylish grey/steel colourway and the spacious desk in this garage conversion. I also love that the owner has built in a ventilation system to allow him to enjoy a sneaky cigar in there every once in a while! 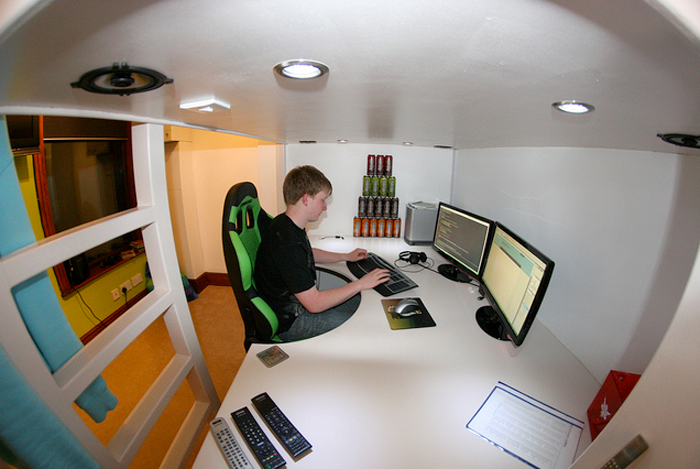 British web developer Joel Vardy really got to grips with his limitations and built a bespoke desk and bed combo that would allow him to make maximum use of his relatively small bedroom. I’ve got to say, the quality of craftsmanship looks brilliant from these photos, not to mention the fantastic green Kawasaki office chair! More details at Joel’s Website. The ingenuity of this conversion by architect Matthew Hofmann really impressed me. I wouldn’t really want to work in a space like this which isn’t necessarily dedicated to being my ‘office’ full time, but if it’s what you want to do, this is the way to do it! I love the way the Mac is mounted on an adjustable arm and especially love the placement of a printer in a draw that slides from under the seat! Very clever. This one did the rounds quite a lot last year, catching the attention and drawing envious glances from designers everywhere. 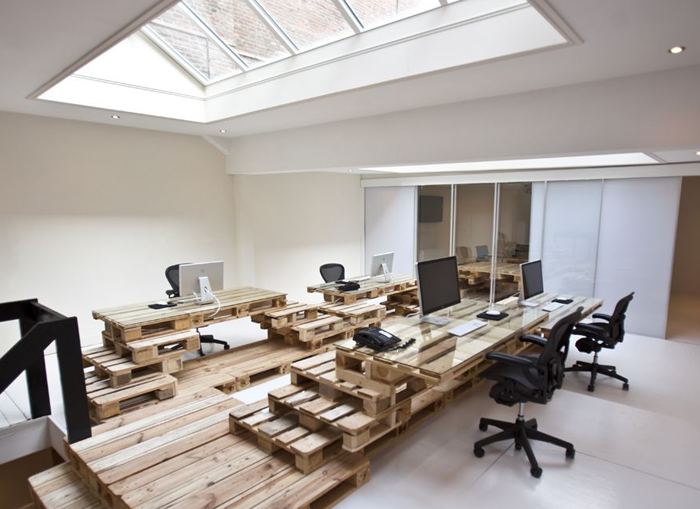 Making use of a pretty rustic and common material – wooden pallets – Amsterdam based design agency Brandbase created a unique and inspiring office space and a talking point to really get themselves noticed. Ty Mattson is a high profile American designer and works from a converted warehouse in California. 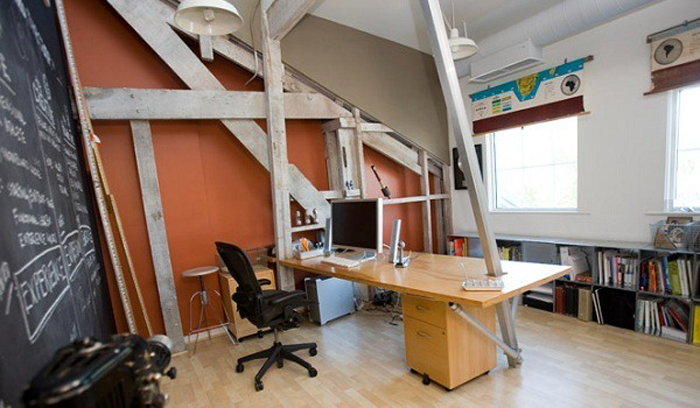 The structural elements add a really nice rustic touch in what looks like a loft space-turned-office. The blackboard is old school and very cool, there’s plenty of inspiration around the place and lots of room to spread out. Lovely stuff. Jessica Hische is another high profile creative from the States who, when she’s not working from home or out and about, resides in a workspace at a converted factory alongside a number of other creatives. It’s a bright airy space and is, of course, decorated and kitted out with impeccable style! Very stylish AND practical – best of both worlds. 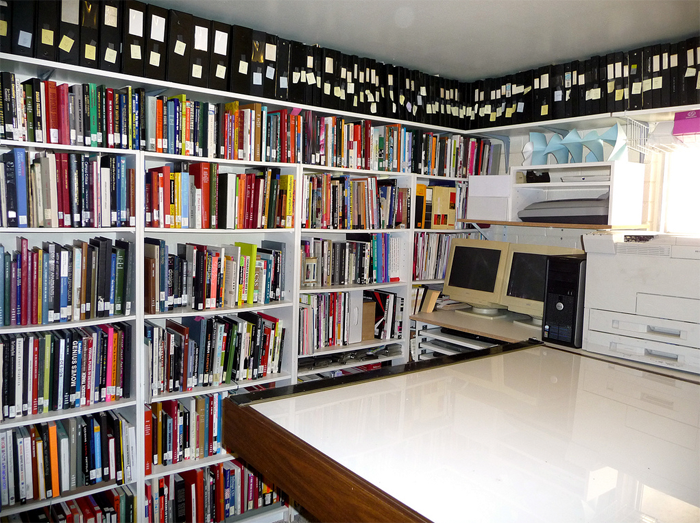 This office belonging to LA Architect Jeremy Levine epitomises a lot of what I wanted from my new workspace. 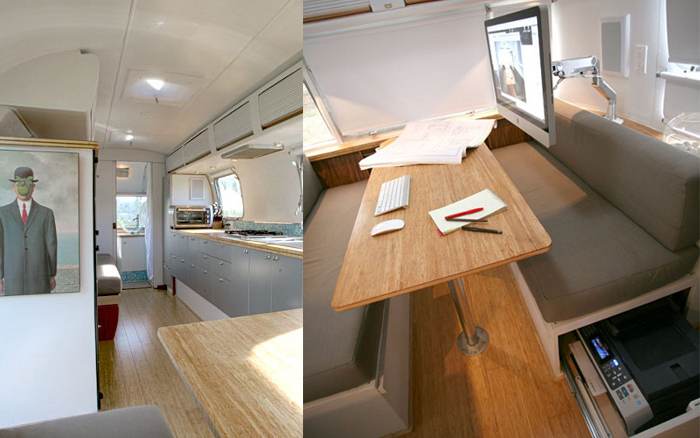 It’s clean and well thought out with space to really spread out and nooks and crannies everywhere for storage. The natural light, suspended shelving and colourful additions of hundreds of books and other reference material make this a place I’d really love to work. Just as a bonus, I also love this workspace sent in to Logobird’s desk space overview by British logo designer Chopeh (aka Pete Lacey). Not completely sure if he was taking the mickey but as he’d just moved to Copenhagen I imagine it isn’t as far from reality as you may have thought! How do you rate all these workspaces? 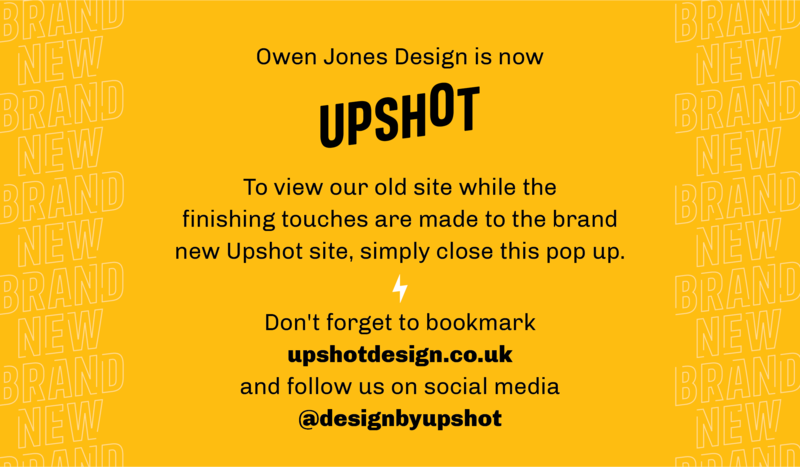 I hope it has been inspirational to see the range of what can be done to personalise your workspace.